Ever wonder what a campus news operation looks and feels like? 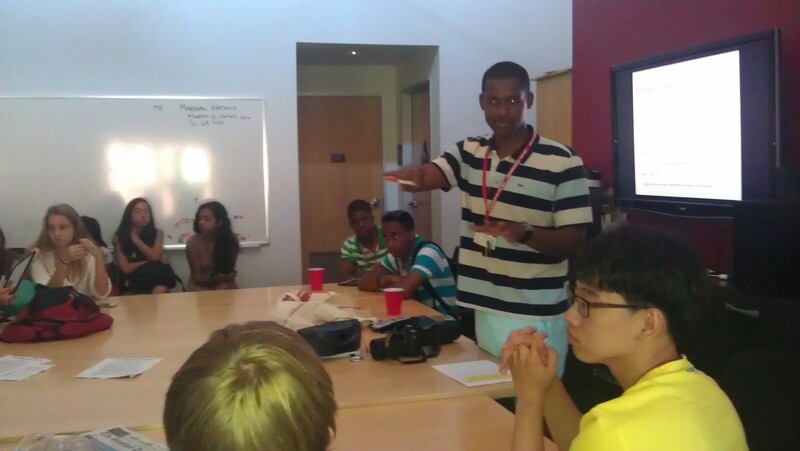 At Newsroom by the Bay this summer, students will get a close-up look at the Stanford Daily newspaper. Indeed, we’ll be holding most of our classes in the Daily’s central-campus headquarters. Eric Burse, who will be returning to NBTB this summer to teach his popular iPad video course, takes a question during his class at the Stanford Daily last June. Dating back to 1891, the Daily is an independent publication and one of the best college publications in the U.S. For the past three years, we’ve been proud to have editors-in-chief and senior editors from the Daily among our team leaders and multimedia showcase judges. Daily editor-in-chief George Chen, a biology major who’s already published a book on Stanford football and the Rose Bowl, will be one of our team leaders this summer. (Left to right): NBTB 2013 students Esme Argueta, Edward Perez and Chizobam Nwagwu interview San Jose Earthquakes player Mehdi Ballouchy during a visit to Lucille Packard Children’s Hospital at Stanford. Stanford is the world’s second-largest university campus, so there’s plenty of news to report, including sporting events at Stanford Stadium. Last year, NBTB students got press-box access to a San Jose Earthquakes soccer game, and this year we hoping to give similar opportunities to even more NBTB’ers when the Los Angeles Galaxy comes to town. We’re excited that NBTB students will once again be able to join the world of student journalism at Stanford. If you’re interested, you’ll need to apply right away — our early bird deadline extension ends April 1. Click here for our application.